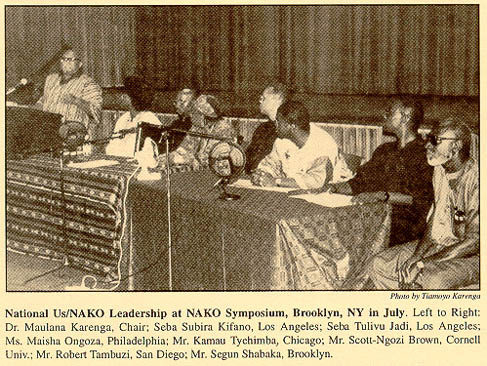 Maulana Karenga was an influential black activist and scholar during the Black Power movement. He identified as a “cultural nationalist”  Maulana Karenga is known for his many contributions to the Black Power Movement, most famously the founding of the Us organization and the creation of the holiday Kwanzaa. The Us Organization stood for United Slaves, and it promoted ideas of black cultural nationalism and black cultural revolution, including a focus on Pan-Africanism. Karengaa co-founded the militant black nationalist organization with Hakim Jamal, the cousin of Malcolm X [2, 4]. The organization advocated for independent black schools, black student groups, and the study of African and African American studies – including African languages. The Us organization’s ideals and goals partly conflicted with those of the Black Panther Party. Conflict arose in 1969, over the proposed leader of the UCLA Afro-American Studies Center. The conflict erupted with the shooting of two Black Panthers, and subsequent retaliatory shootings on either side . The groups repeatedly disagreed on organizing styles and approaches. Karena, notably, critiqued the BPP’s free breakfast and health care programs for not being “revolutionary” . Regardless of their disagreements, both parties had very similar goals. Many critiques of Karenga and the Us Organization were also rooted in Karenga being perceived as an intellectual, which created a class-based barrier within the black community. There was a rising number of anti-intellectual activists that critiqued scholars and activists, including Karenga and other famous intellectuals like Angela Davis . Kwanzaa was literally established as a form of emergent memory to challenge the white-washed dominant narrative of the United States. The holiday is based on African agricultural traditions and is designed to allow people of African descent to reflect and celebrate their ancestral origins. The word “Kwanza”means first in KiSwahili. The holiday was given an extra a (Kwanzaa) in order to symbolize the seven days celebrated, and seven principles . Note: Kwanzaa was intended to be a usable  form of memory; it was intended to reconnect African Americans with their African heritage. The video discusses the processual nature  of our memory of Kwanzaa, how it shifted from a radical civil rights tradition to a commercialized holiday. When I reflect on my own previous understandings of the holiday, I remember being taught of Kwanzaa as an alternative to Christmas. In my memory, Kwanzaa was ahistorical, not a recently created holiday. While Kwanzaa was established as an attempt to disrupt a dominant memory of American history, but it has been forgotten over the past 50 years. I was curious about how Kwanzaa is remembered more broadly, and specifically in the black community. Here are two funny, and interesting, videos that are also monuments to the forgetting of Kwanzaa, and other aspects of the Black Power Movement. Note: It is clear from both of these videos that there has been a level of distanciation since the creation of the holiday, which I find very interesting because the holiday is so recent and even Karenga, the founder, is still alive. The term Kwanzaa has been conventionalized as an alternative holiday, but it is no longer widely instrumentalized as a symbol of black power. Kwanzaa is a holiday that we are all at least somewhat aware of, but we know very little about. We also know very little about the history behind its creation, or Karenga himself. One of the central goals of both the BPP and the Us was to dismantle a racist system of that erased black history and culture from daily life and our educational system. Our lack of knowledge on these organizations, activists, and holiday, are a testament to how little has changed, and how much work is left to be done. Ayubu, Kani Saburi. “7 Facts About Dr. Maulana Karenga, Founder of Kwanzaa.” Black Art Depot Today. Black Art Depot, 31 Dec. 2011. Web. 20 Apr. 2017. Brown, Scott, and Clayborne Carson. Fighting for Us: Maulana Karenga, the US Organization, and Black Cultural Nationalism. N.p. : New York U.P., 2003. ProQuest Ebrary. Web. Karenga, Maulana. “Kwanzaa: A Celebration of Family, Community and Culture.” The Official Kwanzaa Web Site. African American Cultural Center, n.d. Web. 20 Apr. 2017. “Maulana Karenga.” Discover the Networks. N.p., n.d. Web. 20 Apr. 2017. “Us: A History of Service, Struggle and Institution Building.” The Organization Us. Us Organization, n.d. Web. 20 Apr. 2017. Zelizer, Barbie. “Reading the Past Against the Grain: The Shape of Memory Studies.” Critical Studies in Mass Communication 12 (1995): 214-39. Web.